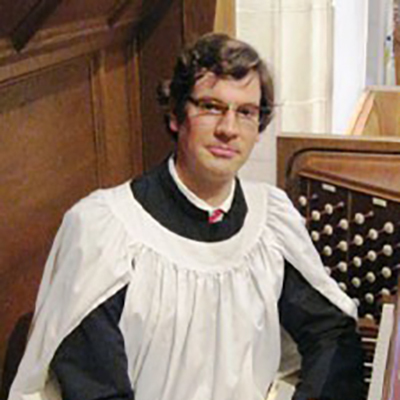 Paul Reese came to St. John’s as Minister of Music and Organist in 2012. He has previously held church music positions in Delaware and the greater Philadelphia area and taught full time in three different classical Christian schools. Paul earned degrees in Bible and Organ Performance from Philadelphia Biblical University, studying organ with Robert Carwithen, violin with Xiao-fu Zhou, and music history with Dr. Samuel Hsu. At Westminster Choir College he earned at Masters in Organ Performance and studied organ with Stefan Engels and Ken Cowan and J.S. Bach with Dr. Robin Leaver. In addition to his organ studies, Paul studied conducting with Joseph Caminiti, Andrew Megill and Joseph Orht. Passionate about church music, he spent three years interning under Paul S. Jones at Tenth Presbyterian Church in Philadelphia, Pennsylvania. As a teacher, he has worked with children’s choirs since high school and worked with Dr. John Feierabend and his Kodály-based Conversational Solfege methodology. After living in eight different states, Paul chose Lancaster as a place he would like to settle, and began teaching music at Veritas Academy in 2010. With a background as a homeschooled student and the oldest of eight children, Paul has a unique perspective on education, put into practice in his work with six different choirs ranging from 1st grade to adult, general music classes, and his work in teaching the children of St. John’s about hymnody. Paul is also on the board of the Lancaster Chapter of the American Guild of Organists and appears in area organ recital series.